Teeth can become darker over time, especially if dark-coloured foods and drinks (such as tea, coffee, red wine) are consumed on a regular basis. Lifestyle habits such as smoking can also contribute to the darkening of teeth. An accumulation of stains on the surface of the tooth enamel and sometimes within the enamel itself are the most common cause of teeth becoming darker. It may be possible to brighten teeth with a professional cleaning, as this can effectively remove the surface stains from the enamel. However, if stains have been trapped more deeply inside the enamel, teeth whitening may be recommended as an effective and predictable way of brightening the teeth. It is important to be aware that the whitening process can only brighten teeth to a natural colour, which is seldom a stark white like a bathroom basin. Enamel is a translucent, porcelain-like substance that sits directly on top of a much darker interior substance called dentine. 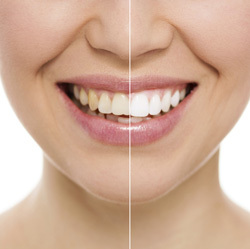 It is the natural colour of the dentine that will ultimately influence the final result of any whitening process. Teeth whitening gels cannot change the colour of dentine. If you prefer a Holllywood-white result but your natural teeth are unlikely to whiten sufficiently with whitening gels, your dentist will be able to recommend another means of achieving this. The most important phase of your whitening is your initial consultation with your dentist. They will examine your teeth carefully to determine the cause of the darkening: sometimes discolouration of the teeth can be caused by decay or deep internal colour or staining which can’t be improved with whitening. They will also check your health history to ensure that whitening can be carried out safely. If whitening will suit your situation, your dentist will make a mould of your teeth so that our technician can make a whitening splint that will fit over them closely and comfortably. Along with your custom-fitted whitening splints you will receive a Whitening Kit containing a whitening gel. You will be shown how to use your kit safely, and a time frame for treatment will be recommended to suit your situation. In most cases, the gel-filled splints are worn for 30 – 45 minutes per day for up to ten days. In most cases, the effects of whitening aren’t permanent: if you do continue to consume dark-coloured food and beverages or continue smoking, stains will start to accumulate on and within the enamel shortly after your whitening has been completed. Your dentist will recommend the best way to effectively eliminate the surface stains after whitening and between professional cleanings, and may also recommend a frequency for topping up your whitening. If you do top up your whitening from time to time, only proceed if your Whitening Splint fits well and doesn’t leak. We have supplies of whitening gel available if you need more. Brighten your smile today, contact us on (02) 6293 1356!